So here I am back with a new series of worksheets which I hope will be of help in any small way to students of Arabic out there. Each worksheet has a little bit of explanation and then some exercises for you or your students to work through. Insha Allah, answer sheets will be uploaded once I have completed the worksheets. 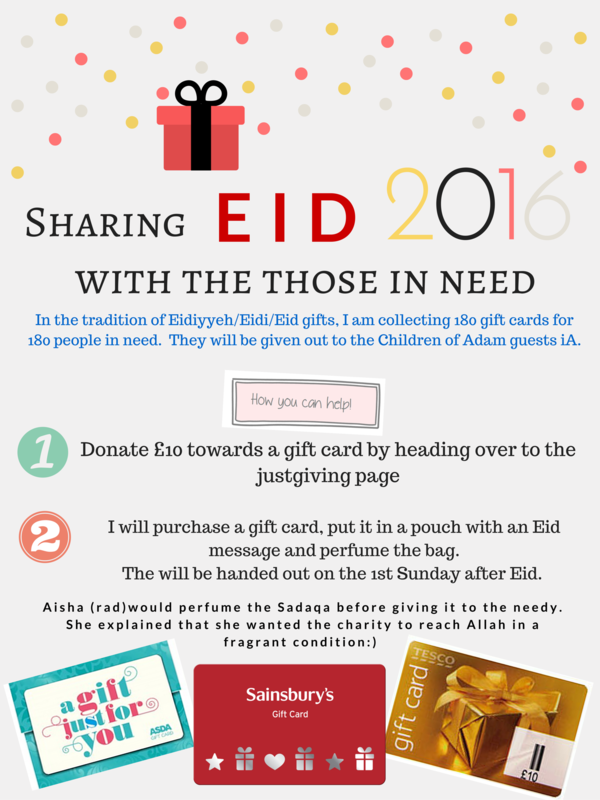 The giving of Eidiyyeh/Eidi/Eid money to children (and sometimes to grown ups too!) by adults is a beautiful age old tradition in Muslim communities. This Eid, I would like to share this tradition with the 180 guests of Children of Adam, a charity which works with the homeless. I am looking to hand out a gift card worth £10 to each guest giving them the freedom to shop for what they need. The gift cards will be of major stores such as Tesco, Asda and Sainsburys. 2. I will purchase a gift card, put it into a pouch with an Eid message and perfume the bag. I will be handing out the gift cards on the first Sunday after Eid iA. How often are the homeless gifted with something? This is your chance to share the spirit of Eid with them and include them in this tradition of ours. Please help me reach my target of 180 gift cards! A massive Ramadan Mubarak to all Arabic Adventures fans 🙂 Jazakallahu kheiran for following this blog, downloading worksheets, sharing with friends, following on facebook and for leaving such kind comments. Here is a little something I made which is Ramadan related. Only need to print out this one A4 sheet of paper and follow the video to see how to make this mini booklet. My students have been utilising hands on activities to revise for their end of year exams. I have allocated 30 minutes independent study time within each lesson for the last two weeks. The girls get the chance to develop their revision skills and to help each other to achieve high grades. I explained to the girls that your friend doing well on the exams means she now understands the Qur’an a little better in the language Allah revealed it in and you helped her achieve this. The following activity was created to help them revise the Arabic prepositions. Up for a challenge? Use the following worksheet will help you learn at least 20 keywords that regularly occur through out the Qur’an. I will be using this worksheet with my Year 10s to help them revise the 20 words. I’ve uploaded the keywords and example ayaahs here for those of you who are learning them for the first time. With Ramadan coming up – it will be useful to learn keywords to understand the Qur’an in Arabic as you recite it during the day, in prayers, in Taraweeh and when the Imam recites ayaat containing these keywords. Enjoy! Hope you manage to learn all 20 inshallah! Here is a review sheet on Negation in Arabic. I will be using this with my Year 10 class. I think it would be best for me to review conjugation in Arabic.